Plastics are synthetic or semisynthetic materials with organic groups. They can all be shaped as desired by applying different techniques and are used in a large variety of application areas. This study analyzes the European market of the following types of plastics: polyethylene (LDPE, LLDPE, HDPE), polypropylene (PP), polyvinyl chloride (PVC), polyethylene terephthalate (PET), polystyrene (PS, EPS), polyurethane (PUR), polyamide (PA), acrylonitrile butadiene styrene (ABS), polycarbonate (PC), polymethyl methacrylate (PMMA), polyoxymethylene (POM), polybutylene terephtalate (PBT), styrene acrylonitrile (SAN), fluoropolymers, and bioplastics. For the first time, all commercially significant plastics from standard products to engineering plastics will be covered in one comprehensive market study. In total, the European plastics market reached a volume of more than 53 million tonnes in 2014. According to the demand volume and price development for the individual types of plastics, the market research institute Ceresana expects sales to rise at average growth rates of 2.9% p.a. to about €104 billion in 2022. The data regarding quantities and revenues of plastics does not include synthetic fibers nor their use in paints and varnishes, adhesives and sealants. Synthetic resins such as epoxy, phenolic, melamine and urea formaldehyde resin as well as silicones are not analyzed either. Having a market share of almost 24%, Germany is the largest manufacturer of plastics in Europe. Belgium ranks second, followed by France, Russia, the Netherlands, and Spain. Figures such as revenues, production, capacities and trade per country as well as the type of plastics and the application experience a very varied development. Therefore, this market report analyzes the development of each product type and application individually. The three dominating application areas for plastics in 2014 were flexible packaging, rigid packaging and the construction industry. Those three areas are currently representing about 70% of the total demand for plastics in Europe. The sales markets with the highest growth rates of more than 2% p.a. are, however, the segments transportation and electrics and electronics. Flexible packaging such as packaging films, bags and sacks as well as shrink and stretch films are mainly used for food packaging, but also as a secondary and tertiary packaging, for example for transportation. Bags and sacks made of plastic films are used in a variety of shapes and applications including shopping bags, garbage bags, shipping bags as well as large sacks for industrial and agricultural goods. The application area flexible packaging is dominated by the polyethylene types LDPE and LLDPE that account for almost 53%, followed by polypropylene and the High Density Polyethylene (HDPE). The area rigid packaging includes containers such as cans, cups, trays, bottles, boxes and caps. The consumption rate of these articles of daily use is rising evermore. Thus, the importance of plastics in their production process is increasing as more conventional materials such as aluminum, tin plate or glass are increasingly being replaced. As plastics are lightweight and versatile, they have cost and environmental advantages, facilitate handling and manufacturing, improve quality and security and offer new opportunities in packaging design. Despite the already lower weight, it was and still is the aim of the industrial sector to produce ever lighter containers (so called lightweighting) in order to minimize resource consumption and transport costs even further. As this process cannot continue infinitely, plastic bags are increasingly used as an alternative, for example in some segments of the beverages market. In Europe, above all PET is used for rigid packaging, followed by PP and HDPE. The sales market construction includes all plastic products for building construction and civil engineering. In addition to residential construction, plastics are utilized in office buildings, sport arenas, and department stores. Examples for the use of individual plastics in the construction industry are: films, cables, tubes, profiles and coverings, sheets and pipes, dowels, screws, glazing, mounting elements, coatings, and membranes. In 2014, the largest demand in this area was recorded for PVC. Over 5.5 million tonnes of PVC are currently used every year in Europe in the construction industry. HDPE is in second place, followed by PS and EPS. Chapter 1 provides a presentation and analysis of the European market for plastics including forecasts up to 2022: The development of revenues, production, capacities and trade as well as the total demand split by product types and applications will be explained for 23 countries. 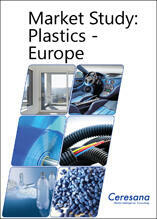 Chapter 2 offers a detailed analysis of applications for plastics. Information is given for the eight segments flexible packaging, rigid packaging, construction industry, transportation, electrics and electronics, industrial products and other applications. Details will be provided for each country's demand as well as the application of individual plastic types in the respective sales markets. Chapter 3 depicts the different types of plastics individually: polyethylene (LDPE, LLDPE and HDPE), polypropylene (PP), polyvinyl chloride (PVC), polyethylene terephthalate (PET), polystyrene (PS), expandable polystyrene (EPS), polyurethane (PUR), polyamide (PA), acrylonitrile butadiene styrene (ABS), polycarbonate (PC), polymethyl methacrylate (PMMA), polyoxymethylene (POM), and other plastics (SAN, PBT, fluoropolymers and bioplastics). The revenues as well as the demand development will be analyzed for each application area and country. Chapter 4 provides useful company profiles of the largest producers of plastics, clearly arranged according to contact details, turnover, profit, product range, production sites, capacities and profile summary. More detailed profiles are given for 116 manufacturers, including BASF SE, Borealis AG, Bayer AG, Braskem S.A., DuPont (E.I.) De Nemours, ExxonMobil Corp., LyondellBasell Industries N.V., The Dow Chemical Company, Total S.A., SABIC, and Ineos Group, Ltd.